So, when I can I go for a walk in the park. This always makes me feel so much better about life, less stir-crazy and gives my life some perspective. I actually feel I can start to breathe again. The Japanese call it Shinrin-yoku or “forest bathing”. It’s basically taking a walk in nature. In Japan the government have been advising it for decades as a way to manage stress and lower blood pressure. We are really lucky to have Trent Park at our disposal and I’m always amazed at how few people I come across there – on the odd times that I manage to leave the house. This made me reflect on the fact that one of the simplest pieces of advice that I often give my patients suffering from back pain is to go for regular walks. In general, backs don’t respond well to us sitting down all day – that comfy sofa is doing you no favours – but what they absolutely do love is a bit of good old-fashioned ambulation. It’s not talking on your mobile phone, it’s not looking down at the ground with hands stuffed in your pockets, it’s walking, hands-free and connecting with the world around you – and in a park or wood that means nature and other people. I’m sure you don’t really need to be told how good walking is for your muscles, including your heart, but how about the fact that taking a stroll with other people is great for conversation, for connecting, which is a great cure for loneliness. 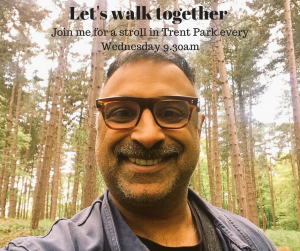 So, in the spirit of forest bathing and my contribution to getting people locally to connect, I invite anyone to come for a walk with me in Trent Park on Wednesday mornings. I will be waiting outside 1st Call Osteopaths, 219 Bramley Road, Oakwood (On the corner of South Lodge Drive and Bramley Road) from 9.15am, and we’ll set off at 9.30 and be back here by 10.30 at the latest. If, like me, you want to leave the house more, and if you’d prefer to walk in the company of some friendly faces, then why not join me? There’s no commitment and no obligations, just a stroll in the park with some new friends. Bring yourself, bring someone else, bring your walking shoes.